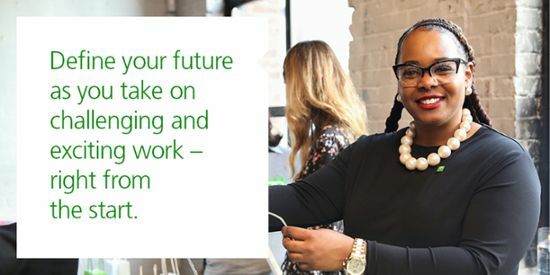 TD Bank Group has been chosen as one of: Canada's Top 100 Employers, The Career Directory, Canada's Greenest Employers, Canada's Best Diversity Employers, Top Employers for Canadians Over 40, Greater Toronto's Top Employers, Canada's Top Employers for Young People. In honor of Women's History Month, the Digital News Center will be presenting a series of stories focused on the theme of "My Truth." We'll feature four female TD Bank leaders speaking about their careers, work in the community and how they've overcome challenges. Angela Conti dreamed of becoming an artist as a young girl. TD – Why Work For Us? TD is the sixth largest bank in North America by branches, serving approximately 24 million customers in a number of locations in key financial centres around the globe. Our mission is to give our clients the best banking experience possible, every day. To do that, we depend on our team of more than 85,000 talented, ambitious people who share our passion for excellence. Whether you have years of banking experience or are just starting your career in financial services, we’ll help you realize your full potential and achieve your career goals. From mentorship and training programs to leadership development, you’ll receive everything you need to succeed. We’ll help you become the best you can be, because a better you means a better us. To be The Better Bank, we need the best people. We discover new ways of thinking, foster a culture of inclusion and make our business stronger by engaging individuals with a wide range of experience, backgrounds and abilities. When you join TD, you’ll be part of a culture built on respect – one that recognizes the unique talents of everyone on the team. With a genuine commitment to diversity, we’ve created a business where employees and customers feel comfortable regardless of background, religion, race, gender, physical ability or sexual orientation. A career with TD gives you the freedom to define your future. You’ll take on challenging and exciting work right from the start. We’ll support your development based on your professional goals. Our solid foundation and strong reputation provide you more support and opportunities for career growth. Once you join TD, you will realize the unique way in which we collaborate– teammates here really care about each other and are passionate about the work that they do. The culture at TD is energized by our commitment to diversity, accessible leadership and community involvement. A career at TD means having the resources to reach your full potential. When it comes to your career, you could work anywhere. With your talent, drive and ambition, we want you to choose us. TD Bank Group is one of the largest banks in North America, with deep roots in the community dating back more than 150 years. 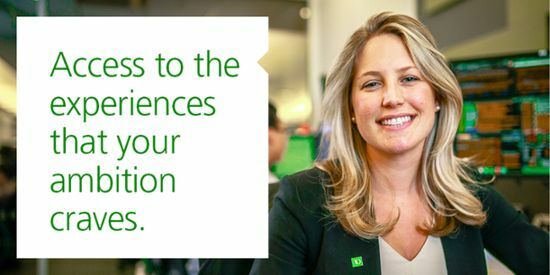 We offer retail, small business and commercial banking products and services to millions of customers across Canada, the U.S. and the U.K.
At TD, we can offer you the chance to build a rewarding and fulfilling career. This is a place where you can realize your aspirations and achieve your goals, within a supportive and inclusive environment. Collaborating with talented colleagues on interesting and challenging work, every employee has the opportunity to make a profound impact on our business – and our communities. We’re committed to making a difference in people’s lives, partnering with local organizations and initiatives that positively affect the areas we work in. When you join TD, you’re joining more than a bank. You are joining a team of 86,000 exceptional individuals and together you will be inspired and motivated, with the tools and leadership you need to become the best you can be. IT is a part of everything we do at TD. From bringing innovative new technologies to our customers to re-imagining the way we work day to day, every day at TD gives you the opportunity to think up creative solutions for a number of unique challenges. Tech is constantly evolving and changing, and we're committed to growing along with it — right across the board. Our IT professionals work with each department at TD to create the platforms, applications, and infrastructures that shape the future of our business — and yours. I applied online. The process took 3 weeks. I interviewed at TD (Edmonton, AB). ne entrevue téléphonique et deux entretiens avec la direction. L'entretien était en anglais seulement. Les gens chez TD sont très sympathiques, il recherche toutefois un type particulier de profil pour travailler avec eux. Processus très honnête. Glassdoor gives you an inside look at what it's like to work at TD, including salaries, reviews, office photos, and more. This is the TD company profile. All content is posted anonymously by employees working at TD.